This was an easy one. 43 points, a career high, 6 assists and 3 rebounds later, Damian Lillard is our player of the night. He did it all and scored wherever he wanted on the floor. 19 of his points came from the 3-point or free-throw line as he hit 4 three’s and 7 of 8 free-throw attempts. 16 of his points came during the three overtimes. Dame was the prime reason Portland came out with a victory against San Antonio on Friday night. He was responsible for 55 of Portland’s points in his masterful performance. 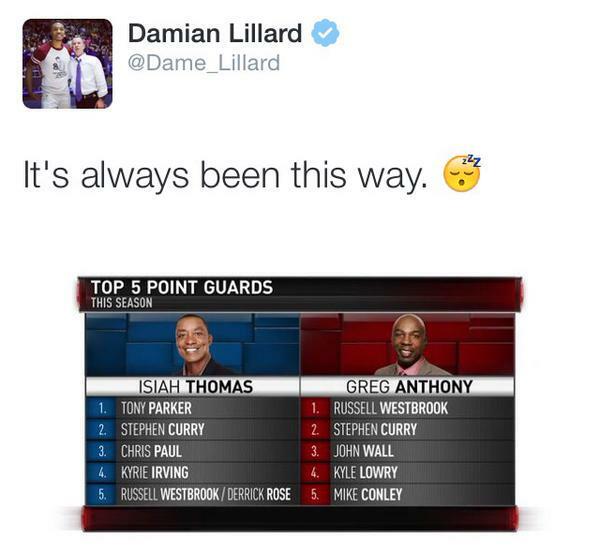 I think it’s time we start considering Dame a top 5 point guard in the NBA, like the picture above suggests.